EUPAVE held the ECLIPS workshop on “Innovative and Sustainable Concrete Pavements” on 23 March 2017 in Brussels. ECLIPS is a multi-national project carried out by Arizona State University and University of California Los Angeles (in the US), Swiss Federal Laboratories for Materials Science (Empa) in Switzerland, Technical University-Delft in Netherlands, and TECNALIA in Spain. ECLIPS is working on the incorporation of phase change materials with a suitable phase transition temperature, enthalpy of phase change and degree of dispersion in the concrete. The project is funded through the Infravation grant, an initiative of the Conference of European Directors of Roads (CEDR) and coordinated by the Dutch Ministry of Infrastructure and the Environment. You can find more information about Infravation and the project funding on our special ECLIPS webpage. EUPAVE and ACPA (American Concrete Pavement Association) are in charge of the dissemination of the ECLIPS project and main outcomes. The theme of this workshop was “Innovative and Sustainable Concrete Pavements”. Attended by around 40 participants, the workshop gathered speakers from the project itself and members and partners of EUPAVE. Karl Downey, Secretary General of EUPAVE, opened the workshop and introduced EUPAVE to the participants. 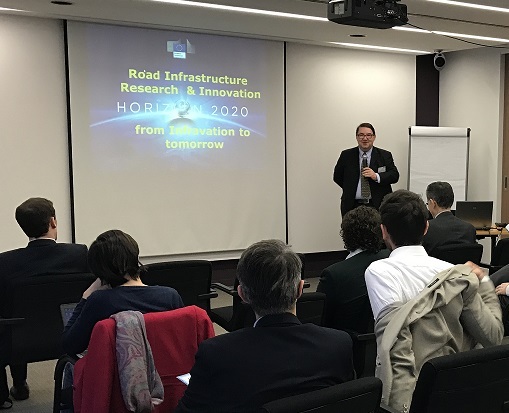 Following this, Mr. William Bird, Project Officer of the Infravation programme at the European Commission, explained the European Commission’s rationale for funding transport research, including the Infravation programme. Luc Rens, Managing Director of EUPAVE, introduced the speakers and moderated the discussion that followed. The morning session focused on the results of the ECLIPS research so far. 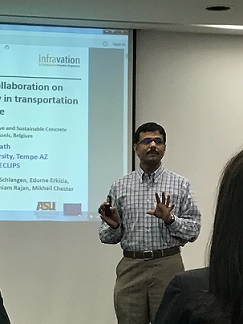 Narayanan Neithalath from Arizona State University and ECLIPS Project Coordinator gave a presentation on this multinational collaboration on enhancing concrete durability in transportation infrastructure. Edurne Erkizia from TECNALIA presented the synthesis of silica encapsulation of phase change materials for addition to concrete. Gaurav Sant from the University of California Los Angeles presented the measuring, modelling and characterising the influence of phase change materials in concrete pavement applications. Andreas Leeman from EMPA presented the impact of PCM on thermal cracking sensitivity and deformability response. Erik Schlangen from TU DELFT presented the influence of PCM on micromechanical properties of cement paste and risk of cracking in concrete. After lunch, Peter Wilbers, of the Dutch Ministry of Infrastructure and the Environment, and Infravation Programme Coordinator, presented the programme. The afternoon focused on innovations from industry. Luc Rens, EUPAVE Managing Director, gave a presentation on pervious concrete pavements. Sergio Tortelli from Italcementi – HeidelbergCement demonstrated a case of sustainable jointless paving using calcium sulpho-aluminate (CSA) cement. Anne Beeldens from AB-Roads presented the inductive charging through concrete roads with a Belgian case study and application. Steven Schaerlaekens from Holcim Belgium presented ultra-high performance concrete for durable transport infrastructure. Narayanan Neithalath gave the concluding remarks of the workshop and thanked the attendees for their participation. • Workshop on Slipform Pavers will be held on 7 September 2017 at Matexpo in Kortrijk (Belgium).